I'm teaming up with Kohls today to bring you a gift guide for all those special guys in your life. I created this gift guide with my sweet husband in mind. Shopping for guys has always been a little bit intimidating, so when I can find a website that has lots of basics as well as unique pieces to choose from, you can bet it captures my attention. Kohls has all that and more this season. Whether you're looking for something simple and casual, or unique and bold, Kohls has the perfect gift for that special man in your life. So, what are you waiting for? p.s. don't forget to check out their sale section for some fantastic deals! This post is sponsored by Kohls. Perfumes are always a good idea! This year's gift for my man will be a huge package of gadget from his favourite TV series, such as Firefly and Cowboy Bebop :) It's not avaible in our country, so I hope he'll be a little bit surprised! Love the jacket! What great ideas. Love the watch & boots! Great guide, I love that bow tie! Great ideas, love the watch! 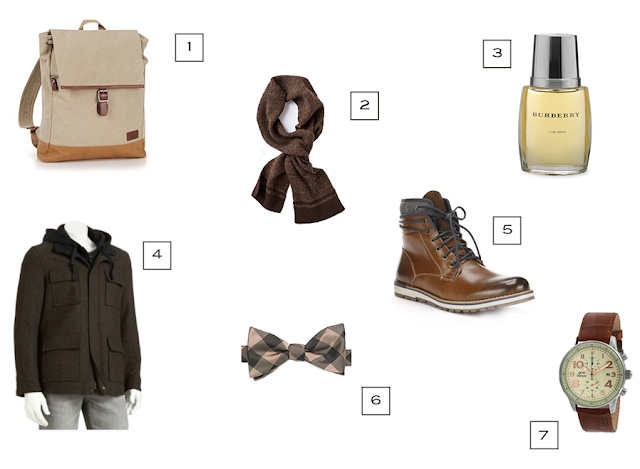 I love a good men's gift guide. It always gives me ideas for my man. I especially love that Levi's bad and that beautiful watch. This is a great guide, guys are so hard to buy for!